Genetic analysis of a shrunken head verifies anecdotal accounts of violent head-hunting in South America. The genetic make-up of a shrunken head has been obtained for the first time. The DNA analysis reveals that the head is authentic and belonged to an Afro-Ecuadorian man. The genetic evidence suggests many myths about head-hunting were true. A remarkably well-preserved shrunken head has just been authenticated by DNA analysis, which provides strong evidence that anecdotal accounts of violent head-hunting in South America were true. The study, published in the latest issue of Archaeological and Anthropological Sciences, marks the first successful effort to unveil the genetic make-up of a shrunken head. "The shrunken heads were made from enemies' heads cut on the battlefield," co-author Gila Kahila Bar-Gal told Discovery News. "Then, during spiritual ceremonies, enemies' heads were carefully reduced through boiling and heating, in the attempt to lock the enemy's spirit and protect the killers from spiritual revenge." Kahila Bar-Gal is a senior lecturer in the Hebrew University of Jerusalem's Koret School of Veterinary Medicine. She is also a faculty member within the university's department of Agriculture, Food and Environment. For the study, she and her colleagues used DNA testing and other techniques to examine the authenticity and possible cultural provenance of a shrunken head displayed at the Eretz Israel Museum in Tel Aviv. 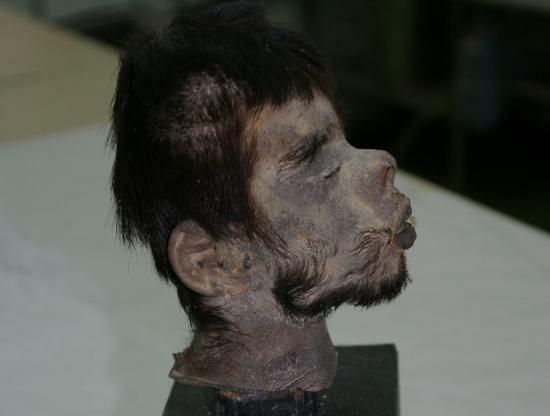 The head remains in an incredible state of preservation, with the deceased man's hair, facial features and other physical characteristics intact. Many shrunken heads are forgeries, with some 80 percent suspected to be fakes. The late 19th through the 20th centuries saw a rise in manufacture of such fakes for profit. The shrunken head at the Israeli museum, however, turns out to be legit. "The shrunken head we studied was made from a real human skin," Kahila Bar-Gal said. "The people who made it knew exactly how to peel the skin from the skull, including the hair," she added, mentioning that it was also salted and boiled. The researchers determined that the skin belonged to a man who lived and died in South America "probably in the Afro-Ecuadorian population." The genes reveal the victim's ancestors were from West Africa, but his DNA profile matches that of modern populations from Ecuador with African admixture. According to the scientists, he was probably a member of a group that fought the Jivaro-Shuar tribes of Ecuador. These tribes also lived in Peru during the post-Columbian period, and were thought to make ritual shrunken heads out of their enemies. Although Kahila Bar-Gal said the DNA could not pinpoint the exact age of the shrunken head, the scientists estimate the individual was killed between 1600-1898 A.D. The early date marks the entry of Africans into the region, while the latter date was when the last major nomadic populations of hunters and gatherers in Ecuador were thought to have existed. Accounts of what happened to shrunken heads after the post-battle spiritual ceremonies vary. There are accounts that the Jivaro-Shuar warriors kept the shrunken heads as "keepsakes or personal adornments," even wearing them at certain times. Leonard Clark, who traveled to the region in 1948, however, said that he saw a shrunken head, called a "tsantsa," used in a ceremony and then stuffed in an old earthenware pot that was placed in the thatched ceiling of the house. "Robbed of its soul, the savagely beautiful trophy no longer had any spiritual value," Clark wrote in a 1953 account. Chuck Greenblatt, a professor in the Department of Microbiology and Molecular Genetics at Hebrew University's Hadassah Medical School, told Discovery News that "the ancient DNA techniques employed by the authors are appropriate and I have no doubt as to the authenticity of their results." Kahila Bar-Gal hopes other museums will consider having certain objects genetically tested, as the method can reveal authenticity and uncover important historical information that may not otherwise be available.